To determine how much your new kitchen or bath remodel will cost, there are a few key factors to keep in mind. You can have a very simple plan or a very elaborate plan with multiple ranges in between. For kitchens, prices can range from $5000 if you choose to complete some of the work yourself to $200,000 or higher. An average kitchen will cost from $15,000-$26,000 including design, products and installation. Bathroom prices generally average between $6500 and $11,600 when everything is being replaced. You can certainly spend less money or more money depending on the features and options you want to include. According to an annual construction cost survey by RemodelingOnline, a minor remodel of a 200-square-foot (10x20) kitchen averages $17,037-$19,366 nationwide; a mid-range major remodel including an island and other upgrades runs $50,860-$59,716; and an upscale remodel for the same size kitchen can be $103,529-$115,549. These are averages; actual costs may be higher or lower. In contrast, CabinetDiscounters.com. reports its remodeling projects have run $3,000-$100,000 but average $12,000-$22,000. According to Consumerreports.org /RS Means Quick Cost Kitchen Remodeling Estimator a 10x6x8 single wall kitchen can range from $13,832 (basic) to $18,401 (standard) to $26,328 (custom) to $54,628 (luxury) on the east coast to $30,706 (basic) to $37,195 (standard) to $58,343 (custom) to $100,819 (luxury) on the west coast. To give you an idea of how far the range of price can go, a 40x36x12 island style kitchen can range from $108,311 (basic) to $108,611 (standard) to $163,308 (custom) to $247, 536 (luxury) on the east coast to $161,953 (basic) to $160,920 (standard) to $236, 700 (custom) to $249, 207 (luxury) on the west coast. For a very basic kitchen remodeling, expect to pay a minimum of $100 per linear foot, measured along the backsplash areas in your kitchen. Be sure to double the measurement where you want both upper and lower cabinetry. High-end projects can cost $1,200 per linear foot or more. If your budget is $5,000 or less, consider surface changes. New countertops and finishes on the walls can create a whole new look for the space. With $10,000, you can add one or two new appliances and address lighting updates in addition to surface changes. A full kitchen remodeling including low-end cabinets, basic lighting, and basic appliances generally costs at least $15,000. Don't underestimate the cost of labor, as many homeowners do in the early planning stages. Anticipate labor to account for 25 to 50 percent of the total cost. Include specialty cabinets in corner areas to take advantage of lost space. Incorporate specialty appliances such as wine coolers and undercounter refrigerators outside the work core so they can be used without disturbing the cook. The average “minor kitchen” remodel cost $14,913 and had a payback of 98.5 percent. The average midrange “major kitchen” remodel cost $43,862 and had a payback of 91 percent. The average “upscale kitchen” remodel cost $81,552 and had a payback of 84.8 percent. The average “midrange bathroom” remodel cost $9,861 and had a payback of 90.1 percent. 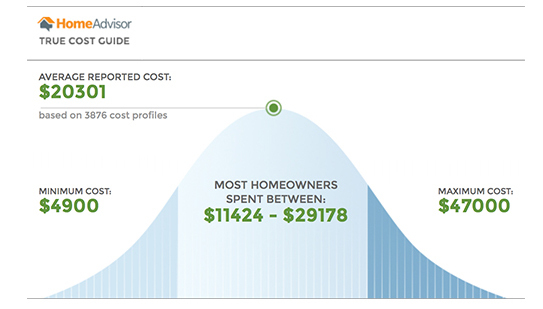 The average “midrange bathroom” addition cost $21,087 and had a payback of 86.4 percent. The average “upscale bathroom” remodel cost $25,273 and had a payback of 85.6 percent. The average “upscale bathroom” addition cost $41,587 and had a payback of 81.1 percent. In order to find out what price range you will fall into, do your homework. Visit showrooms, look at current kitchen and bath magazines, ask friends who have been through the process, make an appointment with a kitchen and bath professional or contractor. The kitchen and bath industry is one of the fastest changing parts of the industry. 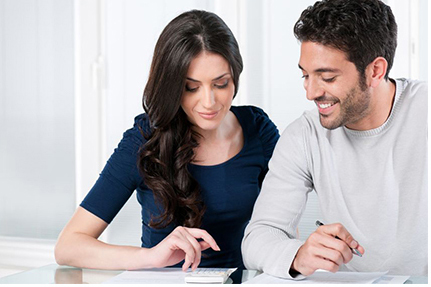 Be prepared to fall in love with more than you budgeted for. There is more to choose from than you can imagine so plan to leave some extra room in the budget, as much as 20%, for those items that you did not anticipate falling in love with. Before you get overwhelmed by these numbers, set your priorities, define your budget and make a wish list and start shopping to see what’s out there. It doesn’t cost anything to shop and price on paper!